I love this hymn book. 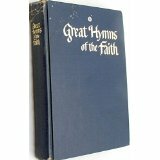 I know that may reveal my personal taste in church music and the era from which I love to sing, but I find a great respect for the gospel hymns written especially in the late 1700s and through the 1800s. Let me add, however, that no one will ever exceed Watts and Wesley, but nonetheless, I have grown up with, grown spiritually with, and been blessed many times with the familiar congregational songs that this book contains.